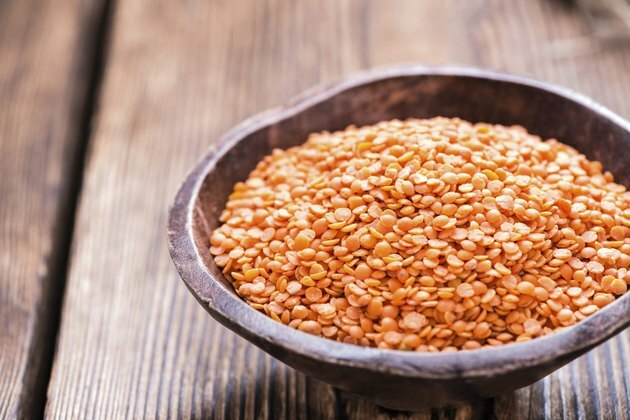 If you store uncooked lentils in a cool, dry area, such as your pantry, they will keep for up to one year. This is nice but not very helpful on a busy weeknight when you are trying to get dinner on the table in a hurry. Although lentils do not require soaking and take less time to cook than dried beans, you can speed up dinner preparations even more by cooking and then storing a few batches of lentils in your freezer. After freezing, lentils keep well for only about six months, so freezing small batches is a good idea. Empty the dried lentils into a colander, pick out and discard oddly shaped lentils and large pieces of dirt and debris, and then rinse the remaining beans under cold running water. Fill a saucepan with 1 1/2 cups water per cup of lentils. Bring the water to a full boil on your stove. Add the cleaned lentils to the boiling water and let them cook for two to three minutes. Reduce the heat to medium and simmer, or cook, the lentils just below boiling point until they are crisp tender. For green or brown lentils, this will take 30 to 35 minutes; for red lentils, about 15 to 20 minutes. Empty the lentils into a colander to drain the cooking water. Spread the cooked lentils in a single layer on a baking sheet. Use multiple sheets if necessary. Set the baking sheets in your freezer for three to four hours, and then transfer the frozen lentils to quart-size plastic freezer bags or freezer-proof containers. Label the containers with the date and a description of the contents, and place them into the freezer. Do not fully cook any lentils you plan to freeze. A crisp-tender texture going into your freezer will ensure a crisp-tender texture coming out.